Ansel Adams was a famous photographer and a lifelong conversationalist who encouraged respect for the natural environment. He has spent a large amount time of his career in commercial photography. Ansel Adams was born in San Francisco, California, in 1902. He was the only child of Charles Hitchcock Adams and Olive Bray Adams, who originally hailed from New England and migrated from north of Ireland during the 18th century. Adams’ father was a very successful businessman who owned a chemical factory and an insurance company. Because of his wealth, Ansel attended both public and private schools during his academic career. Adams had a badly broken nose due to the aftershock from the great earthquake of 1906 in San Francisco. His nose was never properly put back into place so it remained crooked throughout his life. This made him very self-conscious and was partly the cause for the problems he had in school. He received only an 8th grade education in school. At a very young age, Adams was interested in the outdoors. He enjoyed taking long walks and exploring. The banking crisis in America in 1907 along with his grandfather’s death, created a great financial loss in his family. By 1912, his family lost their affluent style of living, and Adams who was a restless kid, was thrown from several private schools during his childhood. This affected his education. At the age of 12, Adams learned to play the piano by himself. Although he was serious about taking music as his career, he was also interested in learning about photography. He made his first amateur photos in 1916 during a family trip to Yosemite National Park. Photography became his hobby and he eventually took a job as a photo technician for a commercial film that helped him to learn more about it. In 1919, Adams joined the Sierra Club and worked as a caretaker in Yosemite Valley, the organization’s headquarters. He presided over the Sierra Club in his later days from 1936 to 1970. While working with the Sierra Club, Adams spent time hiking, exploring, and taking many photographs. Adams’ first photograph got published in 1921. The very next year, Best’s Studios started selling photographs that he had taken at Yosemite. Some of Adams’ works were published in limited edition collections, like Taos Pueblo and Parmelian Prints of the High Sierras. In 1932, his first one-man-show was held in San Francisco. Ansel Adams also taught, gave lectures, and worked on various assignments in the field of photography in the San Francisco area. He opened a gallery for the arts and during the 1930s, he published books on the extensive methods of photography, insisting on the importance of careful craftsmanship. In 1935, Adams wrote his first instructional book entitled Making a Photograph: An Introduction to Photography. In 1936, Adams’ photographs were exhibited by Alfred Stieglitz, a well-respected artist, in his New York gallery. Adams also published a series of books, including Sierra Nevada: The John Muir Trail (1938), Illustrated Guide to Yosemite Valley (1941), Yosemite and the High Sierra (1994), and My Camera in Yosemite Valley (1949). Ansel Adams was one of the most distinguished photographers ever. He received several awards both during his lifetime and after he passed away. Some of those awards include the Hasselblad Award (1981), the Sierra Club John Muir Award (1963), and he was also entered into the California Hall of Fame in 2007. 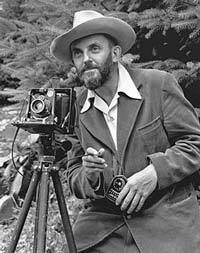 Ansel Adams was confined to bed for about a month due to a surgery to remove cancer in September of 1983. He died in April of 1984 in a hospital in Monterey, California, however, as a result from cardiovascular disease.